The treatment of basal-cell carcinoma (BCC) with a new combination of lasers – pulsed dye and Nd:YAG – has yielded some good results, offering the potential for nonsurgical treatment. A research team from Harvard University, which had previous success in treating BCC with a combination of pulsed dye and alexandrite lasers, is studying the effect of repeated treatment of BCC with pulsed dye and Nd:YAG lasers. The investigators treated superficial and nodular subtypes of the disease of varying diameters. Basal-cell carcinoma tumors, before and after treatment using pulsed dye and Nd:YAG lasers. The top row shows the tumors prior to treatment, while the bottom row shows post-treatment results. Courtesy American Society for Laser Medicine and Surgery. As part of this study, 10 subjects with 13 biopsy-proven BCCs received four combined PDL and Nd:YAG treatments at 2- to 4-week intervals. The tumors and 4 mm of peripheral skin were treated using standardized parameters delivered with a 7-mm spot with 10 percent overlap. The treated area was excised and evaluated histologically for residual tumor. 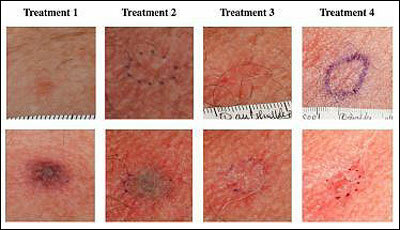 The researchers found that many skin cancers measuring less than 1.5 cm cleared with the series of four treatments. The study uncovered some potential reasons for treatment failure, including tumor subclassification (superficial basal-cell carcinoma) and the use of blood thinners that could inhibit clot formation after laser treatment. The team plans to further refine its strategies for laser-based anti-angiogenesis-based treatment of basal-cell carcinoma. 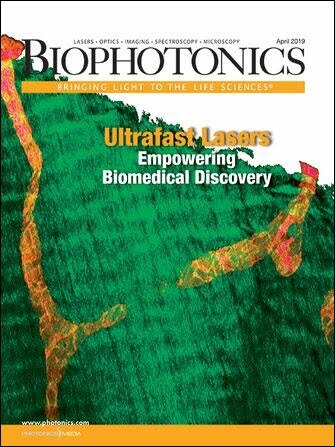 The work is published in Lasers in Surgery and Medicine. For more information, visit www.aslms.org.